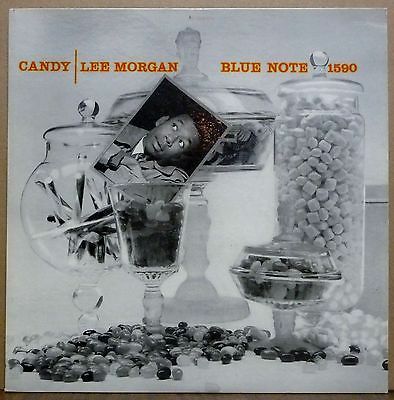 LEE MORGAN "Candy" BLUE NOTE Original LP 1590 SUPERB! UP FOR AUCTION IS AN ORIGINAL PRESSING OF LEE MORGAN "Candy" LP ON THE BLUE NOTE LABEL (MONO 1590). THE VINYL HAS THE DOUBLE SIDED DEEP GROOVE WITH THE 47 WEST 63rd NYC LABEL ADDRESS. THE VINYL ALSO HAS THE "EAR" & RVG STAMP IN THE DEAD WAX. The album has no INCor "R".THE HEAVY & GLOSSY COVER IS IN EX CONDITION WITH ONLY A FEW LIGHT NON-FEELABLE MARKS AND CLEAN LABELS, PLAYS GREAT. THE LAMINATED COVER IS IN EX CONDITION WITH NO SEAM SPLITTING OR WRITING. GRAPHICS ARE NICE. PLAYERS INCLUDE: SONNY CLARK, DOUG WATKINS & ART TAYLOR.GRAPHICS ARE NICE.CLEANED ON A VPI RECORD CLEANER. THE VINYL IS STORED IN AN AUDIOPHILE INNER SLEEVE. PLEASE ASK ANY QUESTIONS BEFORE BIDDING. BLUE NOTE RARITY IN SOLID CONDITION.PAYPAL ACCEPTED.ALSO, INACCORDANCE WITH EBAY'S ACCEPTED PAYMENT POLICY, WE ACCEPT VISA, MASTERCARD, DISCOVER, AND AMERICAN EXPRESS PROCESSED THROUGH OUR ELECTRONIC MERCHANT ACCOUNT. YOU CAN SEND US YOUR CREDIT CARD INFORMATION BY EBAY MESSAGE, EMAIL, FAX, OR BY PHONE.